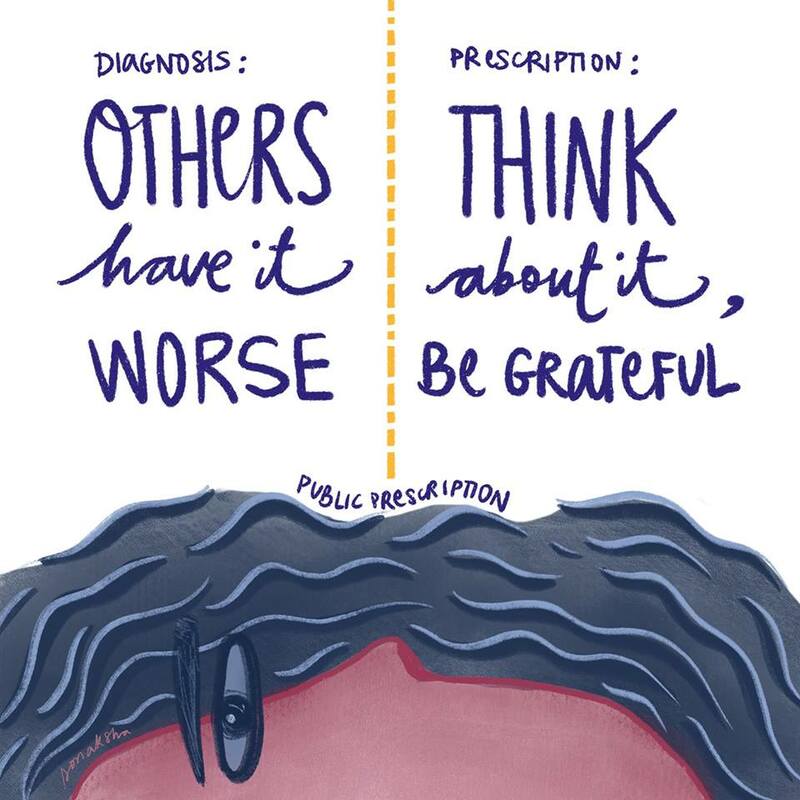 This is Part 2 of the Public Prescription Series, containing illustrations and typography by Sonaksha Iyengar, in which she looks at the advice that persons who exhibit emotional and/or mental distress are often subject to. 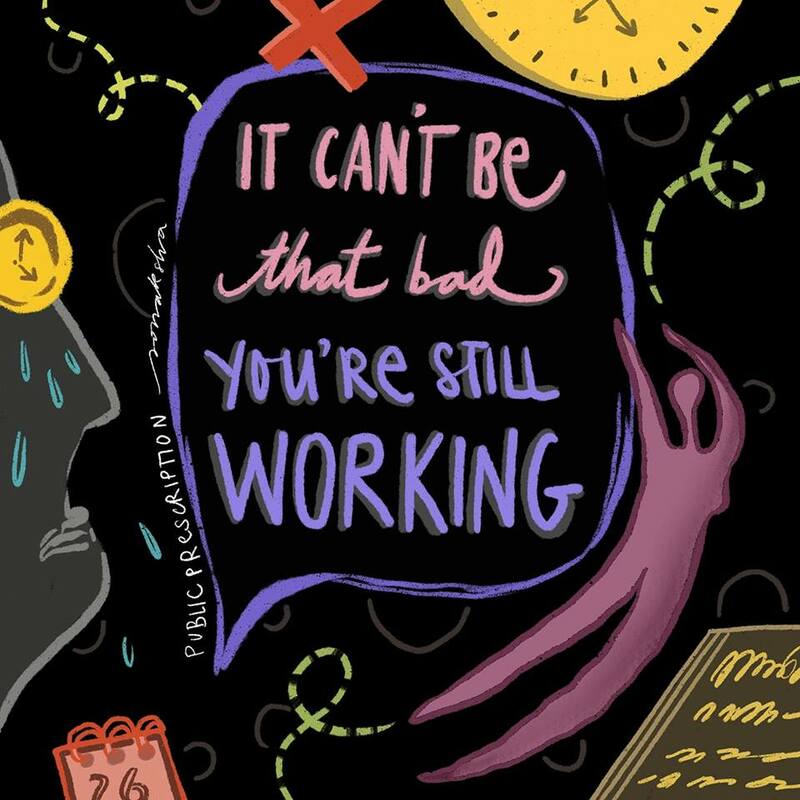 Her illustrations throw light on how mental health is conceived of as a personal “failure” to cope rather than seeing it is as a complex reality for people. Therefore, the “solutions” that people offer lack empathy and are bereft of any actual support to the person. 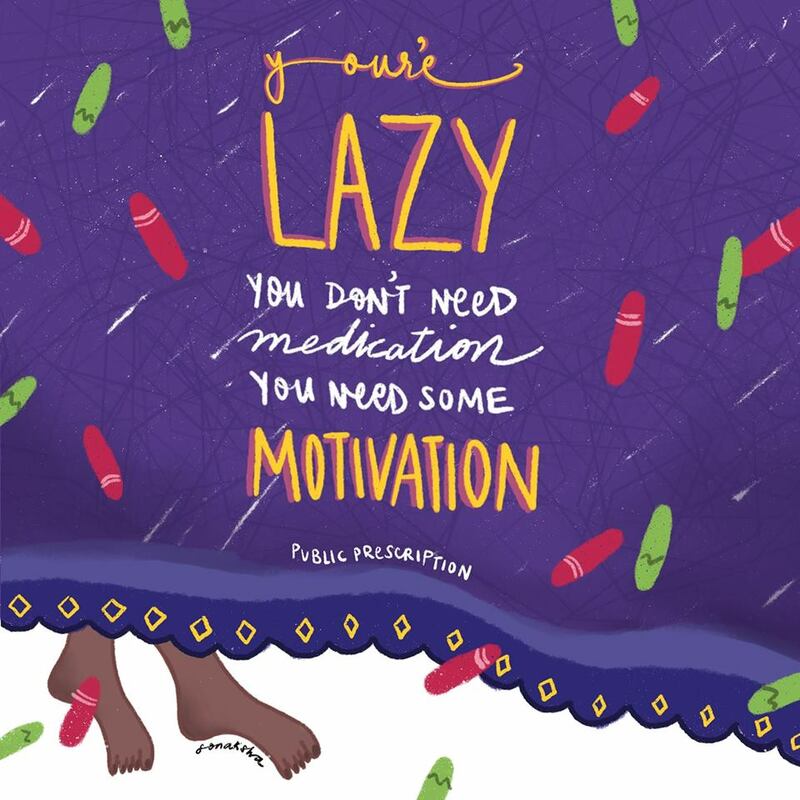 Below are some of the illustrations by Sonaksha that highlight some of these “prescriptions”. 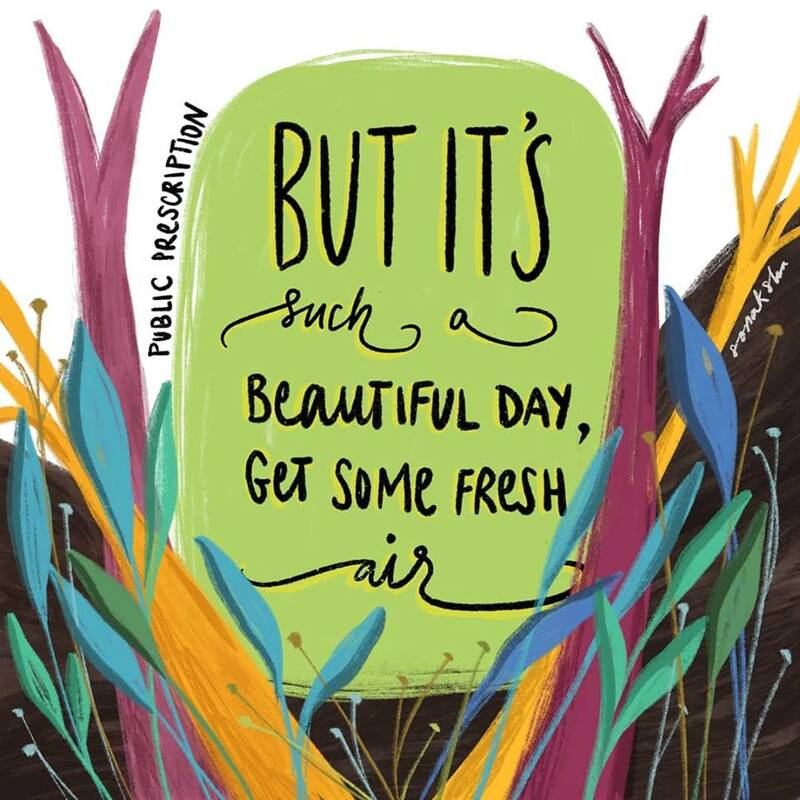 They say love and fresh air are all one needs, but that’s not exactly how it works with mental illness. In fact a lot of times, the idea of stepping outside one’s safe place itself can be daunting for someone living with a mental illness. Often guilt and negative self talk are already constants for many of us; so reminding us that it is a beautiful day, while with the best intentions, can make us feel like we are being ungrateful or not putting enough effort which just contributes to an endless spiral. There is a widespread misconception, “why can’t you just be happy or grateful? All will be okay” I can’t even begin to describe how much this diminishes someone’s struggle/journey. And while it may seem like happiness is the answer to it all, it is not that simple. Mental illness is not a choice. It is as much an illness as diabetes or an ulcer, so can we not undermine it? 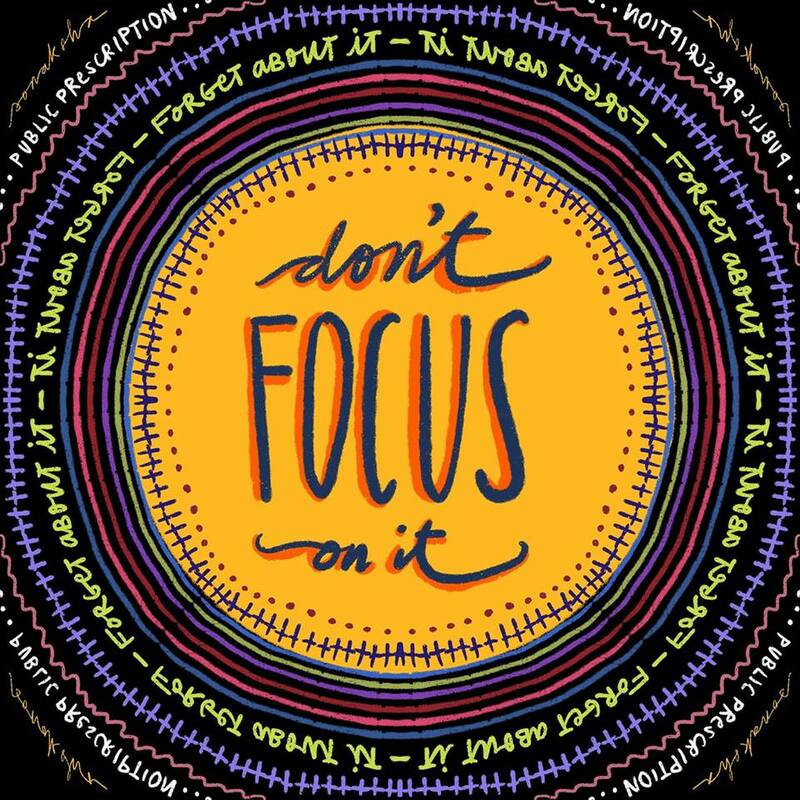 Repetitive thoughts and behaviours and negative self talk are extremely common with most mental illnesses and people think it’s as easy as ‘forgetting it’ or ‘not focusing on it’. Again it comes down to believing that we have control over these thoughts and behaviours. It is not as simple as that. There are so many factors that come into the picture, but of course it seems to be an easier option to just blame the person. However, I also wanted to talk about how we (as people living with mental illnesses) fall into loops of guilt and shame about these thoughts and behaviours and try to make them go away. Of course since it is not that easy, it becomes all the more painful and debilitating. And so the cycle goes on. I could go on and on, but the point is: if you know someone who is living with a mental illness, please don’t ask them to forget about it or avoid focusing on these thoughts. It really does not work that way. It’s not a choice. Can we please stop putting people’s pain on a scale? You cannot measure pain, you just cannot. It is easier in theory than in practice because we have been geared to compete in every way and form of our lives, pain is no less. So the instinctual thing to do seems to be to compare it. But no, that’s just not how it works. There is no hierarchy to pain. Your pain is as valid as mine. Of course it is important to check in and be grateful for all you have. But saying that someone living with a mental illness is just ungrateful is so wrong! Laziness is defined as the quality of being unwilling to work or use energy; idleness. The key word here is unwilling, but with time and use of the word in various situations we throw it around more casually than we should. One such instance is when people substitute a mental illness with the word lazy. Mental illnesses can be extremely debilitating, which often means that even basic tasks can become arduous. Whether that is getting out of bed, having a shower or making a meal, what might seem effortless and the bare minimum, can be a strenuous thought for someone living with a mental illness. If you have told people you have a mental illness they expect you to look unkempt, pale, have droopy eyelids, a swollen face and so on. Suppose you are wearing make up, bright clothes or even decide to accessorize with a cap, the immediate assumption is that you are lying. Here is the thing: yes, the tiniest tasks can become arduous when you’re living with a mental illness, but mental illness shows up in different ways and there is no one size fits all way to approach it. A lot of times mental illnesses are invisible, as are many chronic illnesses. Also, who gets to judge the validity of one’s illness? Telling someone they are pretending or making up a mental illness is extremely distressing. The sad part about this is that it does not end with seemingly ignorant people. I have had so many doctors say this to me, repeatedly. That is supposed to be a safe space. It is exhausting to have to constantly feel like you’re not ‘sick’ enough, as if this is a competition to qualify for. And so, as I repeatedly like to say, just because it is not visible, does not mean it is not real. 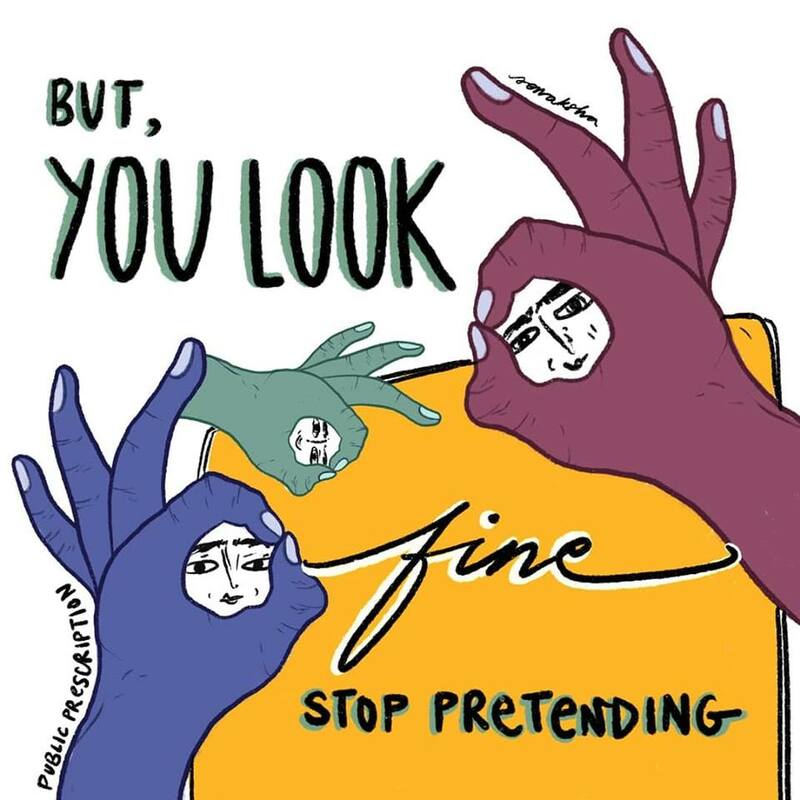 Mental illness does not ‘look’ a certain way. We can be high functioning and still be living with a mental illness, like many of us are. But it is not just about that. Being able to take time off work is a luxury. Not everyone can do it because not everyone has the resources or the agency to. So just because someone is still turning up to work everyday and getting things done, it does no mean they are not in pain or that they do not have a mental illness. We need to stop measuring the validity of pain, the plausibility of an illness. Just because you can’t see it, does not mean it is not real. 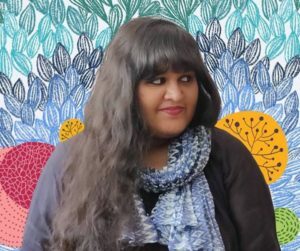 Sonaksha Iyengar is an illustrator, writer and book designer working primarily through digital art, lettering and watercolour. She explores questions of mental health, self care, body image and body positivity through her work. Some of her projects include A-Z of Mental Health, Garden of Kindness and Public Prescription. Along with an interest in kindness, she hopes to continue working with developing the idea of safe spaces for conversations through her work. Her work has been featured across the globe in platforms like Buzzfeed, Design Taxi, Al Jazeera, Huffington Post, Mashable, The Hindu, My Modern Met, The Mighty, Metro and The Ladies Finger among others.